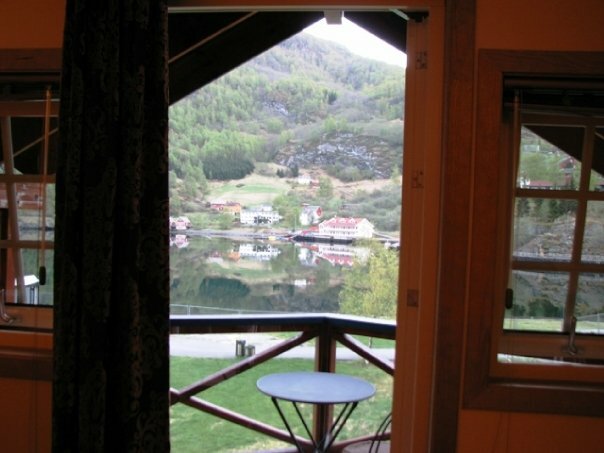 The Flåm Railway gets an estimated 450,000 visitors each summer. Lucky for us we were the ONLY ones on the train this time. Actually, I should say we were the only visitors. 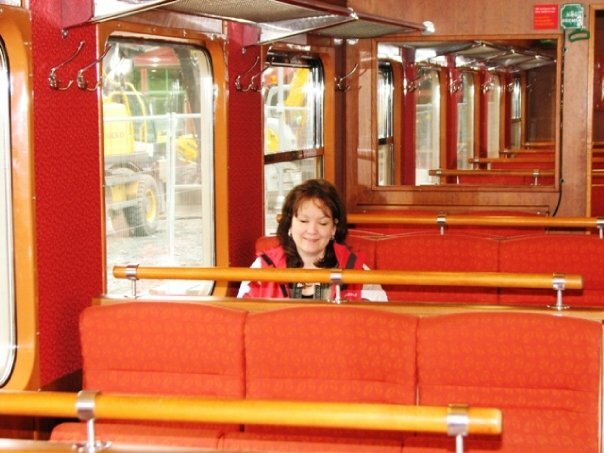 The last cabin on the train was for laborers that were working on the houses getting them ready for the season. They carried lumber, bikes, everything they needed as it was the only way to get up and down. The train would stop whenever they needed to let them and their items get off. I'll include a little history of the railroad, taken from their website as I show you some pictures. 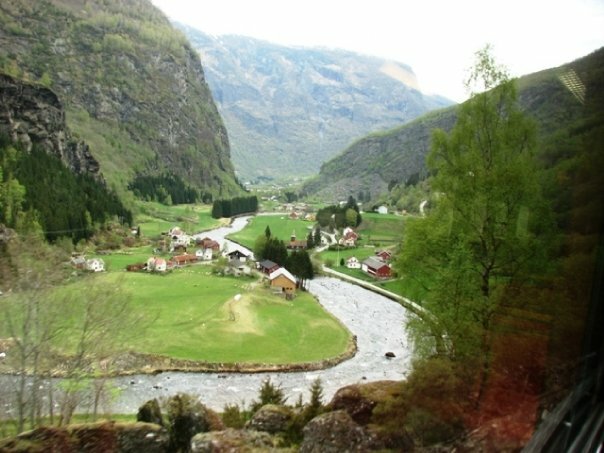 "Each year, this exciting stretch of railway attracts people from all corners of the world, making the Flåm Railway one of Norway's major and most spectacular tourist attractions. 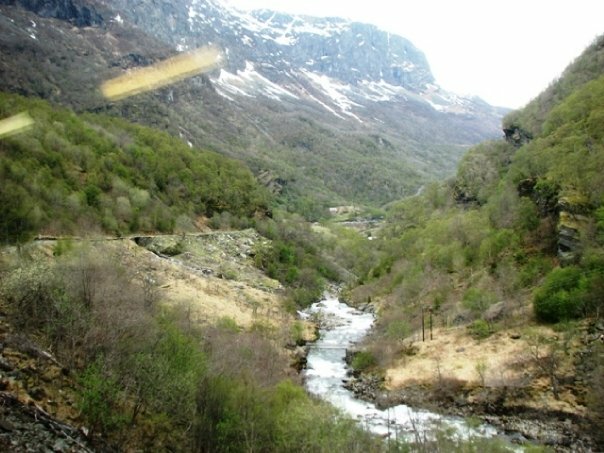 The train journey provides some of Norway's wildest and most magnificent scenery. 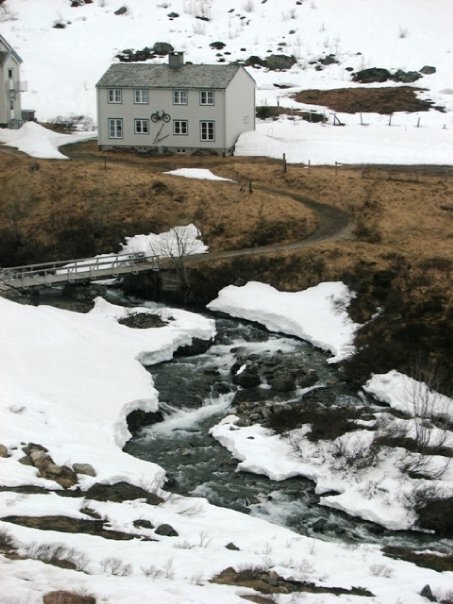 On the 20 km-long train ride you can see rivers that cut through deep ravines, waterfalls cascade down the side of steep, snow-capped mountains and mountain farms cling dizzily to sheer slopes." 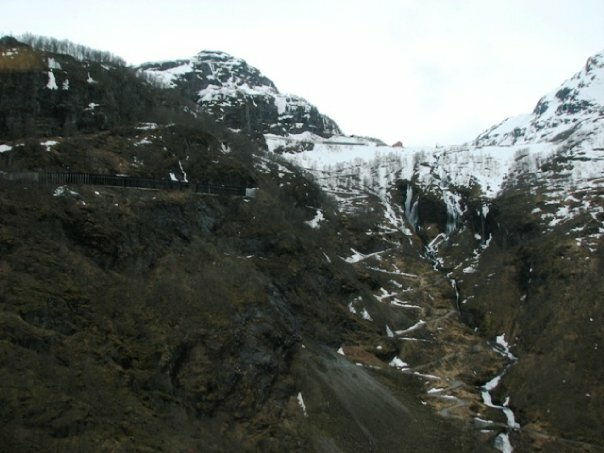 "The Flåm Railway is one of the worlds steepest railway lines on normal gauge. The gradient is 55/1000 on almost 80% of the line, i.e. a gradient of one in eighteen. 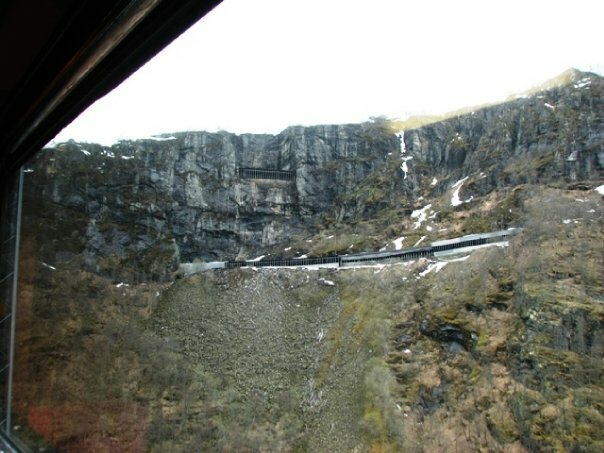 The twisting tunnels that spiral in and out of the mountain are manifestations of the most daring and skilful engineering in Norwegian railway history." 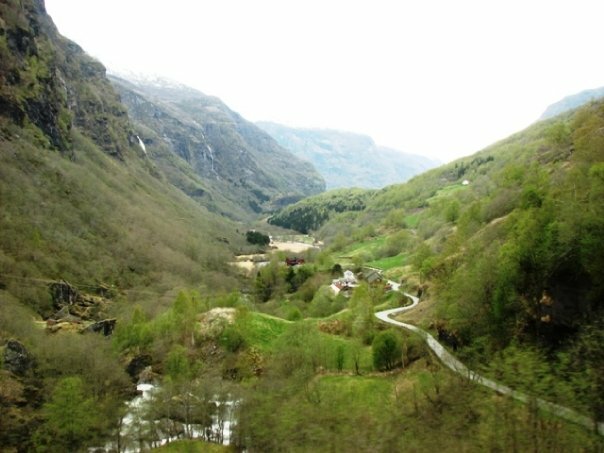 "The Flåm Railway, which passes through the beautiful, narrow Flåm valley, is regarded as a masterpiece of Norwegian engineering. 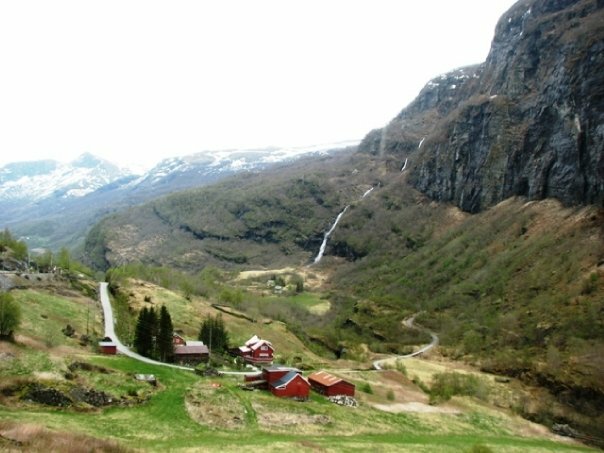 The only thing lacking when the railway line between Oslo and Bergen was opened in 1909, was a branch line to the Sognefjord. 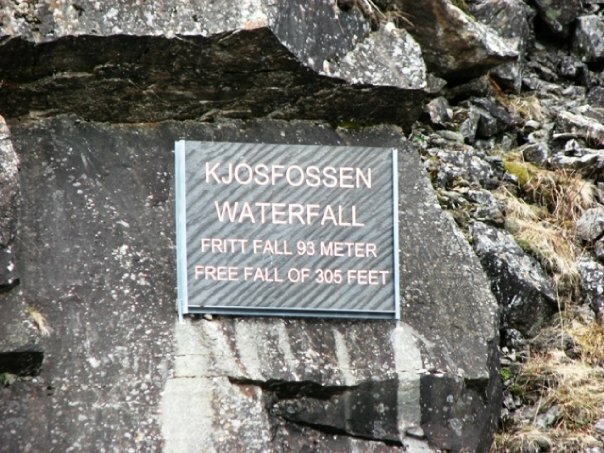 In order to assure a transport route to the fjord, work was begun on the Flåm Railway in 1923. It was to take 20 years to complete." I really like this picture ... the water is so clear and you can see how far we've come on the train so far. "The most time-consuming work was on the tunnels. These were excavated manually. Only two of the twenty tunnels, which have a total length of 6 km, were excavated using machines. Every metre of tunnel cost the labour force, the navvies, up to a month's hard work. The labor force, 120 strong at the outset, rapidly increased to 220." "The steep mountainsides were a major challenge, the solution being to build hairpin tunnels in order to equalise the big differences in altitude on the steep mountain. The danger of avalanches and rock falls also constituted a problem. 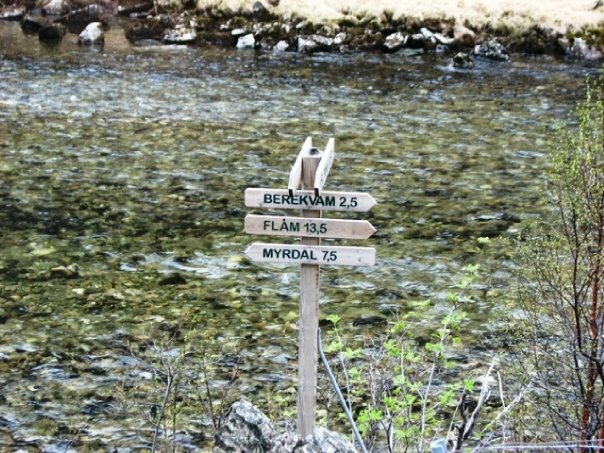 To avoid these hazardous stretches, the line crosses the river and valley three times during the journey, but it does not cross the river on bridges. Instead, the river is led through the mountain in tunnels underneath the railway line." 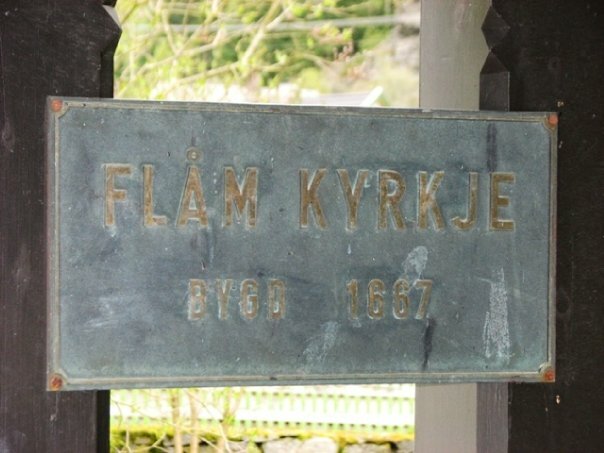 "The Flåm Railway was opened temporarily for steam engines on 1 August 1940. The newspapers reported that the first train "honored" the navvies by carrying freight in the cars. 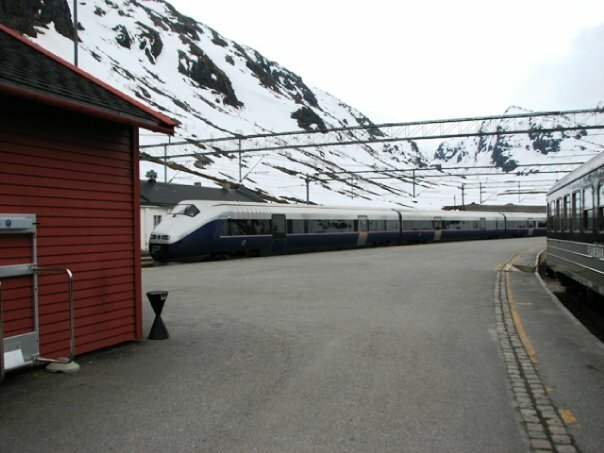 The railway was opened for passenger traffic not long afterwards, with two trains in each direction that connected at Myrdal with the day trains on the Bergen Railway. 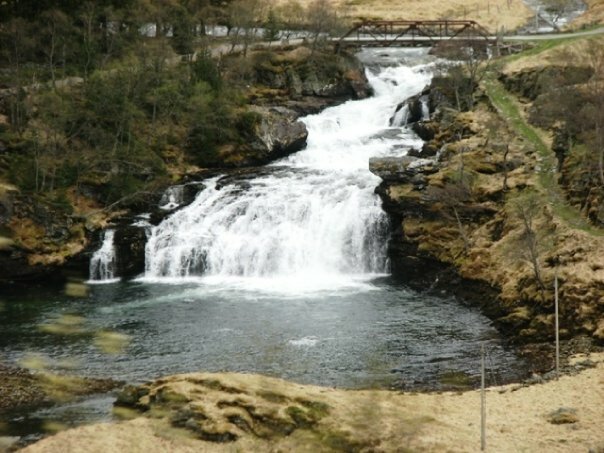 Electrification of the Flåm Railway was completed in 1944 making it one of the first Norwegian railway lines to be electrified. The journey took an hour and a quarter as against one hour today." Now we are at Myrdal and hooray! Nobody is getting on the train going back down either. One of the REALLY great things about being on the train by ourselves was that the conductor came back and talked to us and told us when to look out which side of the train for the best views. They are going to stop the train for us going back down so we can look at a waterfall. I love the bicycle on the side of the house! 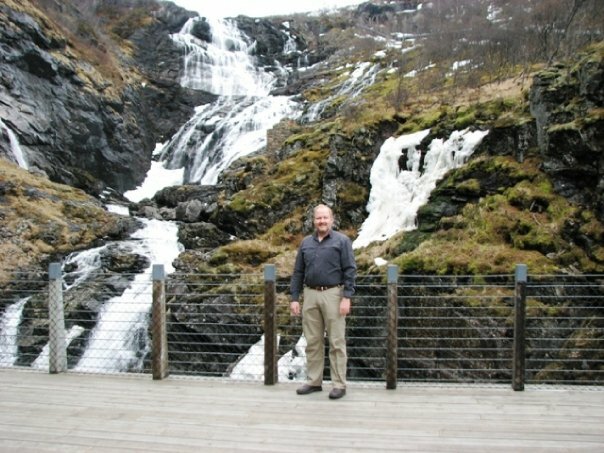 It's a really nice waterfall, but I think that by this point we had seen so many waterfalls that this one just didn't impress us that much. 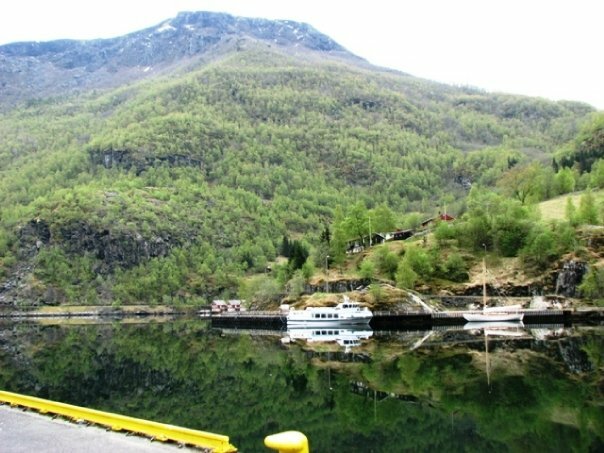 And now we are coming back into Flåm. It almost looks like those boats are sitting in the middle of trees. The reflection off of the very clear still water is just amazing! And on the train we caught a view of this church so we decided to walk back and check it out. 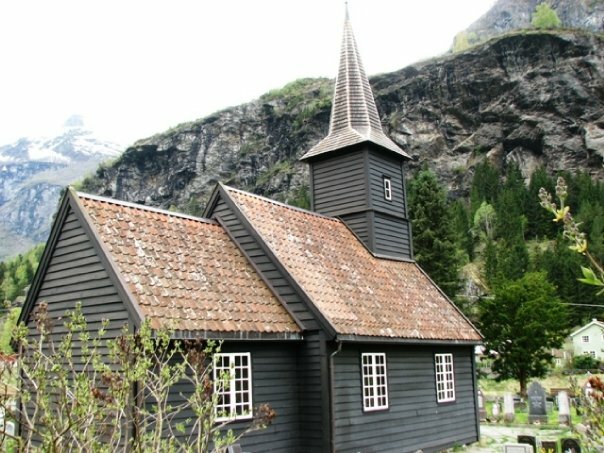 I've tried researching, but haven't had any luck finding out anything about the church.